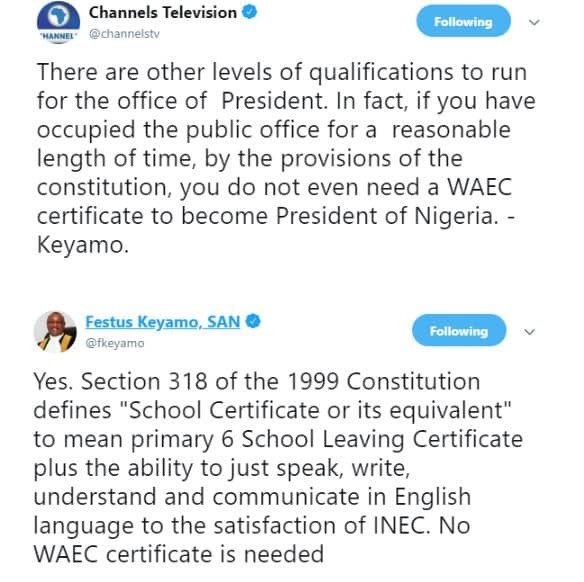 Lawyer and spokesperson of the 2019 Buhari campaign organization, in the person of Festus Keyamo, was recently a guest on Channels TV wherein he extensively discussed the issue of President Buhari’s WAEC certificate. In the interview, Festus Keyamo says a WAEC certificate is not a prerequisite to becoming the President of Nigeria. According to him, if you have occupied public office for a reasonable length of time, by the provisions of the constitution, you do not even need a WAEC certificate to become President of Nigeria.